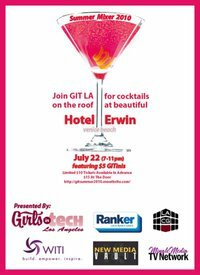 Join Girls in Tech LA on the roof at the gorgeous Hotel Erwin in Venice for sunset cocktails, networking and more. Enjoy $5 GITinis and an amazing rooftop view of west LA while mixing and mingling with some of LA’s brightest names in tech, media, and entertainment. Space is limited, so RSVP to guarantee your spot.